Rheta Osborne passed away on August 26, 2018, age 85, at the Blue Valley Lutheran Nursing Home in Hebron, NE in the presence of loved ones. Memorial services will be held at the Alexandria, NE Presbyterian Church on September 8, 2018 at 1:30 pm. Inurnment will follow at the Alexandria Presbyterian Cemetery. Price Funeral Home of Hebron is in charge of arrangements. Rheta was born on February, 12, 1933 in Alexandria, NE to Charles and Maurine DeLong. She graduated from Alexandria High School in 1950. After graduation she attended Lincoln School of Commerce to further her education in the field of business education. Initially, she worked as a secretary in Lincoln, Omaha, and Topeka, KS where she learned skills that later in life would prepare her for ownership of her own businesses. During this time she met and married Richard V. Purzycki in 1951. To this marriage two children were born. Richard (Charles) of Beatrice, NE and Jon of Alexandria, NE. During the marriage Rheta and Richard lived in Hardford, CT after the birth of their first child, home to Richard and his family. Upon their return to Nebraska the couple made their home in Alexandria, NE. Rheta opened her own business a beauty shop which she managed successfully for many years building a strong and vibrant clientele from several of the surrounding towns. Rheta then joined forces with her mother to operate a business called the “Hilltop Café” where home cooked meals and tasty pies greeted their customers and was known for the friendly atmosphere and great food. Rheta also worked with clients from the Blue Valley Community Action as an advocate. Later in life she married Floyd “Ozzie” Osborne of Fairbury, NE in August of 1984. Ozzie and Rheta shared an active life of fun and jokes as well as traveling. Ozzie was a storyteller and they shared many laughs. While married to Ozzie, Rheta began her second career as an insurance agent working for Security Associates Insurance Company, and opened her own branch (Security Associates West). 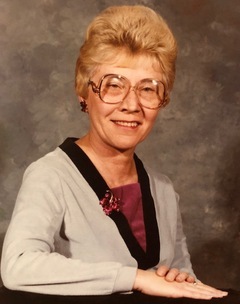 She was a top salesman many times for the company and traveled extensively throughout the territory of Kansas and Nebraska selling annuities and nursing home insurance to her customers. The past two and a half years she has been a resident at the Blue Valley Lutheran Nursing Home in Hebron, NE. She was a faithful lifelong member of the Alexandria Presbyterian Church. Rheta was known for her quick wit, enjoyment of music (she loved to sing and had a great alto voice), a talented dancer and enjoyed attending area dances strutting her stuff. Additionally, she was a gifted poet and often shared her poems with family and friends. Her pride and joy was spending time with her children and family attending events as often as she could. Rheta was preceded in death by her parents, aunt Leota Huber, husband “Ozzie”, brother in-law Donald Nichols, and grandson, Ryan Purzycki. Cherishing her memory is: her sister, Marcia Nichols of Wood River, NE, two sons, Jon and Chuck. Grandchildren: Johnathan, Deidre, Daniel, and Charlie. Niece, Michele Gill of Norfolk, NE, nephew, Todd (Patty) Gill of Omaha, Heather (Jose) Medrano of Grand Island and several great-grandchildren, cousins and friends. No visitation as cremation services were chosen by the family. Memorials may be given in her memory to the Alexandria Presbyterian Church.